As Carol Anne might have said in "Poltergeist," "It's baaaaaack." Except this is much less scary, and a lot more delicious. The McRib, the tangy, tasty, wait-those-aren't-really-bones rib-like sandwich that was originally introduced way back in 1981 is now available at a McDonald's near you for the next six weeks. 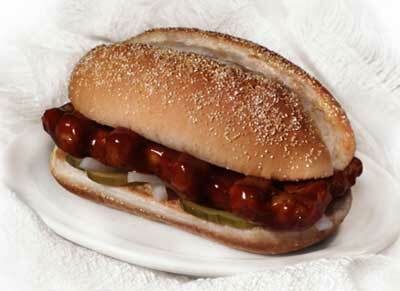 Just how awesome is this pork sandwich -- slathered with BBQ sauce, pickles and onions -- to deserve all the hype? Well, it's pretty good, but its appeal was pretty much tied to how difficult it was to find. Sure, we could visit the McRib Locator site to figure out where this sporadically available treat popped up, but now Mickey D's is putting on the menu of all its stores until mid-December. It's the first time in 16 years it's been this universally easy to find. Are you going to take advantage of this McReintroduction and give this urban legend of a sandwich -- and its 26 grams of fat -- a taste? After reading this the other day, I decided to try a McRib last night and LOVED IT!! I'd always been kind of "meh" about it before, but now I'll definitely go back for more before they take them away again. I can't imagine they freeze well, but I'll try and see if we can somehow save the McRibby goodness for after they're gone. Thanks Brian!! We are thankful for all of you! Which '80s actor directed "Burlesque"? Our first contest! And it's bionic. Classic Clip Monday: "Twilight Zone: The Movie"